Kai Syng Tan collects influences into ventures not only belonging to the genre of ‘locative media’, but also performance, essay/diary, collaborative digital (and non-digital) storytelling. Re-Drawing Boundaries online exhibition presents the artworks including her virtual avatar Kaidie that explore digital realities as well as ask important questions about the construction of identity. In the interview, she refers herself as the personal pronoun “we” which also embraces Kaidie as a product-manifestation of and response to the technological conditions of today. 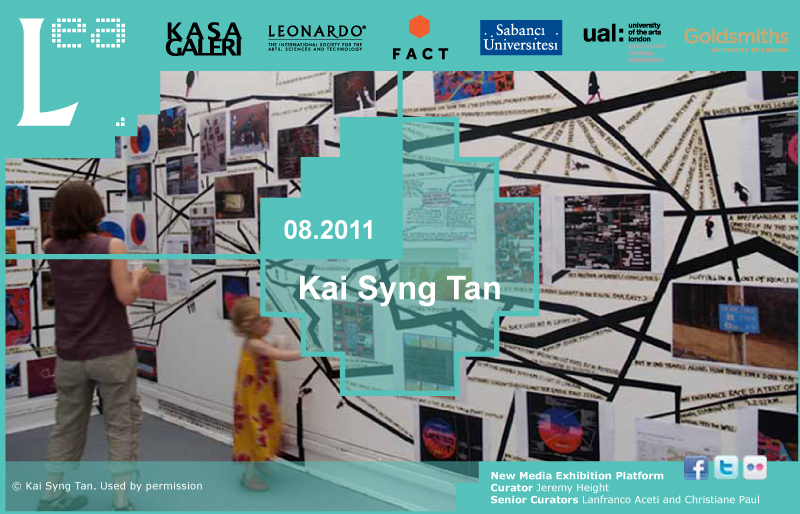 Kai Syng Tan‘s work has been shown in more than 45 cities (Guangzhou Triennale, Biennale of Sydney, ICA London, House of World Cultures, Yamagata International Documentary Film Festival). Kai Syng has won several awards (SFIFF merit video award, Young Artist Award, Most Promising Young Artist Award aged 18), residencies (NIFCA, Japan Foundation) and grants. She is an advisor in a panel at the Media Development Authority of Singapore. For 7 years she was also a digital arts consultant and film lecturer, and ran a Video Art degree programme in an art university. Trained in Tokyo (MA in Imaging Science and Arts, Excellence Award, Distinctions, Musashino Art University), Chicago (School of Art Institute) and London (BA in Fine Art, 1st class Honors, Slade School of Fine Art) on full scholarships, Kai Syng’s interdisciplinary work (performance, cine-essay, installation, text et al) examines the notion of ‘reality.’ In one of her previous lives, she had done this by viewing the world through a self-reflexive video camera of a restless tourist/traveler and had been named ‘one of Singapore’s foremost video artists’ Her large-scale permanent public commission can also be seen at the Bras Basah MRT Station (from 19:29 hours daily) in the Arts and Heritage District of Singapore.